Post-crisis, Do Central Banks Wield Too Much Power? His book, Unelected Power: The Quest for Legitimacy in Central Banking and the Regulatory State, examines the enhanced role of central bankers and offers principles for them to follow to be good stewards. Tucker, who is also chair of The Systemic Risk Council, joined the Knowledge@Wharton show on SiriusXM, to share his insights. Knowledge@Wharton: Considering the title of the book, should central bankers be elected officials? Paul Tucker: No, it would be the wrong solution. But your question gets to the underlying problem. When we were born, the big decisions were taken by the people that we elected. Now, too many of the really big decisions are taken by judges or central bankers or regulators. We need to be careful about how we design these institutions, and we need to keep them to a narrow role. Knowledge@Wharton: What are the most important things we need to consider when looking at central banks? Tucker: I think slightly different problems come up in different jurisdictions. I’ll give an example from the United States and an example from Europe. In the U.S., the Federal Reserve and its congressional overseers need to get to a place where the Fed isn’t suspected, fairly or unfairly, of lending to institutions that are fundamentally unsound, which is bailing them out. That’s the job of politics, not the job of technocrats. It doesn’t matter whether they did do that, they’re perceived by some people on both the right and the left to have done so. They need to shed that perception and shift their policies and the way they explain their policies so that people feel more comfortable with them. Knowledge@Wharton: How can central bankers help to better educate the public on what they do? Did the global financial crisis give us a better understanding of their role? Tucker: Former chair Ben Bernanke going on [CBS news show] 60 Minutes was like talking directly to the American people. I thought that was a good initiative. Actually, I think the Fed chairs should go on television a little bit more. I don’t think they should compete with politicians, but they should try and explain what they do in as straightforward a language as they can muster. The European Central Bank has ended up being the guarantor of the whole economic system, yet they can never solve the underlying foundational problems. That, too, is an instance where the Central Bank has ended up being super powerful, yet it can’t deliver prosperity. It can only deliver stability. Knowledge@Wharton: How is the Bank of England dealing with Brexit? Tucker: Reflecting the results of a referendum in which the citizen of the U.K. voted, they need to stick to their basic job, which I think is what they’re doing: keep the economy going. Keep inflation in line with their target of 2%. Keep the banking system stable. That’s gotten more difficult because they don’t know what the deal is going to be. They don’t know what the terms of trade with Europe or the rest of the world are going to be. But they can’t solve that. They need to be responding to what hits them. They can’t be active players in what is a political, even constitutional, debate between the U.K. and continental Europe, and highly, highly charged in domestic British politics. Knowledge@Wharton: What are the key functions of a central bank? Is it relatively the same in every nation? Tucker: Yes. In a sense, the idea is simple: You put at arms’ length from the politics of both the executive and the legislative branches the task of maintaining the value of money in people’s pockets and in their bank accounts. This has to do with keeping inflation reasonably low and reasonably stable, and keeping the banking system safe and sound so that the money in bank accounts is going to be worth what people think it’s going to be worth. That doesn’t mean that individual banks can’t fail, but that the whole system shouldn’t collapse, which of course is exactly what happened in 2007. I think it happened because central bankers — and I was one for a long time — had done a pretty good job at keeping inflation low, but they hadn’t paid enough attention to the resilience of the banking system. But that mission is now accepted again across the world. What’s changed is the politicians are much less involved in the broad swath of economic policy than they were a few generations ago. Knowledge@Wharton: How specifically has that changed? Let’s use the United States as an example. Tucker: What is the face that you associate with the United States finding its way out of the Great Depression? President Roosevelt. Whether people liked what he did or didn’t like what he did, that’s the face you associate with it. We’re 10 years after the crisis. There are lots of articles and conferences on 10 years after, and who are the faces? Fed Chairman Ben Bernanke, Treasury Secretary Hank Paulson, Treasury Secretary Tim Geithner. It’s a massive change in only a few generations that we’ve gone from President Roosevelt being the face to a bunch of unelected people being the face of crisis management, rather than President George W. Bush or President Obama. That’s not a point about those men individually. Our societies are now much more reliant on unelected power than on elected people, and this has had consequences. Knowledge@Wharton: Are we better off now? Tucker: If I compare it again with the 1930s, I think the Fed was much faster out of its blocks this time in 2008 than its predecessors were in the 1930s. That’s true in Britain, and I think that’s true in continental Europe. It’s part of why we didn’t revisit the horrors of the Great Depression. But what didn’t happen after a few years is big action by government. I’m one of those who thinks that the U.S. government could have come in with some fiscal actions around improving infrastructure across the American continent. I think that would have been good for the productive efficiency and capacity of the economy. It would also have meant that the Fed interest rate could have been a bit higher. There have been costs to what the Fed has done. It has fueled exuberance and a bit of a boom in financial markets. While it’s helped the economy as a whole, it’s hurt … people who rely on income from savings. I do not think this is the Fed’s fault. The Fed or the European Central Bank in Europe, they’ve ended up filling a vacuum left by politicians. As citizens, we shouldn’t be comfortable that the political actors didn’t act. Knowledge@Wharton: How has the scrutiny of central bankers continued post-crisis? Tucker: I think this is part of a trend. I’m sure you remember a book by journalist Bob Woodward called Maestro about Fed Chairman Alan Greenspan. The title of that book should make us all cringe. These are meant to be unelected people doing the job given to them by Congress. There should be no question of maestro. You get this slightly politicized scrutiny and debate when people [realize], “These people are in charge,” and no one in the Federal Reserve wants that. But it depends a bit on the design of the institution by Congress, and then Congress being prepared to be the cavalry when necessary. Knowledge@Wharton: When Yellen was chair, there were many news stories about President Trump questioning the path of the Federal Reserve. What was your reaction to that? Tucker: In every country with an independent central bank, occasionally politicians make comments about what the central bank should do. You just have to shrug them off in the sense that you’ve been given a job by Congress, or in my case by the British Parliament. They’ve made you independent of politics. They can take that power away. But so long as the power given to you by the sovereign parliament exists, you can’t heed day-to-day commentary from the president or the finance minister or whatever. You just have to shrug that off. I’m sure that’s how central bankers around the world feel about it. Knowledge@Wharton: You talk in the book about a money credit system and what central banks and institutions can do. What does that mean? Tucker: The most extraordinary thing about our monetary system is that most of the money all of us have isn’t the money that’s issued by the central bank — it’s monies created by private-sector banks. These private-sector banks are useful because they take decisions about who can borrow away from the state and make it part of commerce. But these banks are fragile. We need to be clearer that central banks have a responsibility, and Congress has a responsibility, for thinking about how we want this mixed money credit system to work. We need to allow individual banks to fail, but not the whole system to collapse, as has happened maybe twice in the 20th century. I don’t think we’ve really paid enough attention to what freedoms should banks have, what constraints should be put on banks, and what constraints and obligations should be put on the Federal Reserve. Knowledge@Wharton: Do we expect to see some loosening for banks in this administration? Tucker: I’ll say two things about that. First, loosening the reins around the community banks, which is part of what Congress has recently done, strikes many people as a sensible thing. Loosening the constraints on the big banks, that’s not a sensible thing to do. The United States isn’t suffering from a lack of credit or lending. A lot of the changes that the international community made in the immediate aftermath of the crisis were good changes. But it’s no bad thing after 10 years for people to think, were the right things done? What I think is a mistake is to think that there was over-shooting on every front. On some fronts there was over-shooting, hence rolling back on community banks. But on some fronts, probably not enough was done. The United States still faces a problem in that you’ve got lots of things that are not legally banks, they could get into trouble in just the same way as banks, yet they’re not able to borrow from the Federal Reserve against good collateral. And people haven’t been brave enough to take on the lobbies. There’s a problem that if you get something that is a new activity that is very like banking that legally isn’t a bank, and initially it’s quite small so you don’t feel you need to respond to it, by the time it’s big enough that actually it matters to the stability of the financial system, they’ve also developed lobbying power. I’ve seen that again and again. I think it’s particularly a problem in the United States. Knowledge@Wharton: I wanted to ask you about the dynamics between the Federal Reserve and other central banks around the world. How different is the structure here, whether the Fed itself or the Federal Open Market Committee (FOMC), in comparison to other countries? Tucker: I’m going to make what sounds like a kind of tiny point, but I think it matters a bit. The Federal Open Market Committee, which decides interest rates in the United States, it’s quite a big committee with 12 voters at any one time and five or six or more talking. That’s too many people to have a proper discussion. I’ve ended up thinking that they kind of negotiate with each other via speeches. This is one of the things the U.K. has got right. The committee is nine. It’s one person, one vote. I think they truly deliberate and change their minds individually in the meeting as they listen to their colleagues. Certainly, I did a couple of times. In continental Europe, it’s even bigger. Whereas I think the United States may have a problem in that respect, I’m pretty sure the continental Europeans do. I want to now tilt the other way that a great strength of the FOMC is the regional representation. This is not an institution that is just from Washington. It’s based around the country. I wish that the leaders in Washington got around the United States a bit more so that the people saw the leaders a bit more. I wonder whether the new leadership there won’t do that. Chair Jerome Powell and the vice chair strike me as trying to speak in relatively straightforward language that the American people can tune into rather than having to read a newspaper to make sense of it. Knowledge@Wharton: How important is it to have an understanding of the differences in regional market conditions when setting policy? Tucker: I had a big experience of that kind when I was making monetary policy in the U.K. In the early 2000s, we were moving towards raising interest rates. One of my colleagues, Mervyn King, who was the governor of the Bank of England, had been out around the country talking to people. They were saying, “Lots of people have been turning up from Poland and elsewhere. We’ve got more capacity in this economy than we thought.” And that wasn’t showing up in the data. The anecdote was that the feedback from business around different parts of the U.K. was more accurate than the data. And if that’s true in the U.K., which is much smaller than the size of the United States, that network of intelligence that the Fed has around the enormous landmass of the United States is hugely important. Knowledge@Wharton: Does that make it more difficult to have unification of something like the European Union, especially from a financial perspective? What role will … the European Central Bank have in the years to come? Tucker: They’ve done a good job at the ECB, but the underlying foundations are weak. Let me give you an example. Someone sets up a business in Massachusetts. All of their customers, suppliers and employees are in Massachusetts, but all of their equity holders are in California. Then maybe there’s a downturn in the Massachusetts economy, and this firm is a big one and it fails. The downturn is bigger because of the failure of this firm, but some of the risk is borne by California because of the equity market. Most transfers of risk across the economy of the United States are done by the equity market, not the fiscal authority. But when they’re really terrible, then the truth is that there are federal support systems for employees who’ve lost their jobs around the whole country. In the euro area, there isn’t an equity market that is cross-continental in the same way. Perhaps even more important, there isn’t this catastrophic federal insurance safety net in extremities. That’s what President Macron in France is trying to promote. In a sense, they’re trying to do the equivalent of what was done by the Founding Fathers [in the U.S.] in slow motion because they’re not doing it in the 18th century, they’re doing it in the 21st century. As Amazon heads for a $1tn valuation, the company usually speaks softly and carries a big stick. Chief executive Jeff Bezos, the world’s richest man, has remained mostly silent as Donald Trump has accused his company of everything from tax evasion to gutting the US postal service. But criticism from progressives such as Bernie Sanders is another story. Last week, Mr Sanders said too many of the company’s workers are on public assistance, and he plans to introduce legislation to make big companies such as Amazon pay for offloading the cost of low wages to the state. Amazon fired back in a blog post, saying that the Vermont senator’s comments were “misleading”, and it encouraged employees to share their stories with him. Amazon says it plans to pick a city on the basis of metrics including the quality of infrastructure, human capital and transport. Yet it has rejected many cities that score well in such areas and required officials to sign non-disclosure agreements about the details of their bids. The current shortlist seems to be heavy on locations with high-ranking US senators and those that included billions of dollars in tax credits and other subsidies in their bids. Meanwhile, Amazon recently secured a very unusual procurement deal with American local governments. It will purchase all the office and classroom supplies for 1,500 public agencies, but will not have to guarantee them fixed prices for the goods. The purchasing will be done through “dynamic pricing”, in which the final charges depend on bids put forward by suppliers on Amazon’s platform. It is a stunning corporate ju-jitsu, given that the whole point of a bulk purchasing contract is to guarantee the public sector competitive prices by bundling together demand. While Amazon claims to offer discounts, a study conducted by the non-profit Institute for Local Self-Reliance concluded that one California school district would have paid 10 to 12 per cent more if it had bought from Amazon. And cities that want to keep on using existing suppliers must move that business to Amazon. This adds up to three things. First, companies such as Amazon, which can leverage data and the network effect to not only play in the market but become the market, are like the house in a Las Vegas casino. They always win. Communities that offer subsidies to lure big headquarters may see positive headlines and short-term gains but the end result is almost always negative. One recent study found that 70 per cent of such subsidies fall into the category of property tax breaks and job creation tax credits. The big companies pay less for their real estate, but human capital is undermined, because property taxes often fund schools in the US. State and city business subsidies have tripled since the 1990s, which leads to a snowball effect — employers that demand skilled workers and good infrastructure are degrading the tax base that creates them. Amazon’s HQ2 competition is taking place at a time when states are less prepared for an economic downturn than they have been in years: It is the wrong moment for local leaders to starve their tax coffers to enrich such a wealthy company. Second, I see parallels in Amazon’s behaviour to the lending practices of some financial groups before the 2008 crash. They used dynamic pricing, in the form of variable rate subprime mortgage loans, and exploited huge information asymmetries in their sale of mortgage-backed securities and complex debt deals to unwary investors including cities such as Detroit. Amazon, for its part, has vastly more market data than the suppliers and public sector purchasers it plans to link. Indeed, I see more and more parallels between online groups and large financial institutions. They each sit in the centre of an hourglass of information and commerce, taking a cut of whatever passes through. Like a big investment bank, Amazon can both make a market and participate in it. Such companies need systemic regulation to prevent them from unfairly capitalising on those advantages. Senator Mark Warner’s recent white paper on platform technology regulation points to “diseconomies of scale — negative externalities borne by users and society as a result of the size of these platforms”. The comparison reminds me of the moral hazard problem posed by the “too big to fail” banks. Finally, Amazon’s behaviour suggests that its leaders are living in a cognitive bubble. The company will inevitably reach a deal with a desperate politician in one of the HQ2 bid cities. But old local political machines are dying. There is no guarantee that the new generation of progressive candidates that look likely to win in November’s midterm elections will be as friendly to big business. Amazon has a big stick. But the one wielded by populists in years ahead may be bigger. For France, keeping Europe together isn’t as important as keeping Germany engaged on French terms. Last week, French President Emmanuel Macron called for a review of defense cooperation in the European Union – because, he said, the EU can no longer rely on the United States for its security. Macron said it was time for the EU to develop a strategic relationship with Turkey and to bring EU relations with Russia out of the Cold War and into the 21st century. On the same day, Macron threw down the gauntlet on Hungary, Italy and any other nationalist European country challenging his self-described “progressive” view of the EU’s future. Perhaps most significantly, France softened its hitherto hard-line position on Brexit. France, not Germany, has been the EU’s dominant voice on Brexit, and Paris’ softening means the European Commission may not be far behind. That France has become the most outspoken champion of European integration is ironic. After World War II, France was one of integration’s most recalcitrant critics. That is admittedly a slight exaggeration – France did desire integration, but not of the cooperative sort. After the war, France wanted to dismember Germany and seize its resources – most importantly its coke and coal – for itself. The goal was twofold: to prevent Berlin from posing a threat to French sovereignty ever again and to rebuild the French economy with German resources. From Paris’ point of view, the only problem with Versailles was that it had not gone far enough, and the end of the war offered a wonderful opportunity to repair its shortcomings. France’s support for the creation of what would become the EU’s grandfather, the European Coal and Steel Community, in 1952 came only after the U.S. and U.K. promptly told France that Germany was not to be dismembered (at least, not any more than it already had been by the Soviets and the Allies). Instead, West Germany would be rehabilitated as a liberal democracy in a new international order, and France would have to learn to live with it. France may have had a seat at the Allied table, but the seat had been offered as a matter of etiquette more than anything else. The Allies knew it wasn’t France that had defeated Nazi Germany and Imperial Japan. Germany’s defeat did not mean France would be allowed to take its place as European hegemon. For the next 66 years and counting, French strategy has been more or less locked in place. The French economy needed privileged access to German imports to recover after the war. And French security depended on British and American guarantees against German revanchism and Soviet ambitions, not to mention material support for France’s ill-fated attempts to keep what was left of its empire in Indochina and Algeria. If France could not destroy Germany, it would do the next best thing – integrate Germany into Europe on France’s terms. In 1948, it was the U.K. and the U.S. urging European integration. By 1950, European integration had become France’s cause celebre. In fact, one of the reasons the U.K. did not join the new ECSC was because the French-designed integration went further than the British were willing to stomach. Emmanuel Macron is this line of strategic thinking made flesh. Macron clothes his support of EU integration in the form of “progressivism,” but that is more personal preference than accurate depiction. The European Union has come under great strain since the 2008 financial crisis. Greece very nearly left. Eastern European states like Hungary and Poland are in open political rebellion. And most worrying of all, Germany has become the center of gravity of the European project. Germany has lost some of its credibility because of its support for austerity and migration, but even so, what began as a French project to control Germany has evolved into a German project to prosper from Europe. Germany, reunified in 1990, has an economy almost 40 percent larger than France’s. Germany’s export supply chain is Europe’s blood supply. In an era when euros, not tanks, define power in Europe, Paris has found itself playing second fiddle to Berlin. For France, all of this means the EU needs serious reform. The answer to this problem from France’s point of view is the same as it was in 1952, when the ECSC came into being – more centralized control, not less. The 1950 Schuman Plan, which led to the creation of the ECSC, proposed to put all French-German coal and steel production under a single joint “High Authority,” which would have the power to set prices, direct investment and take whatever other measures were necessary to encourage competition. The ECSC never fully exercised its considerable powers, but its original conception was nothing less than French control of German resources dressed up as a multilateral “European” institution. It is possible to see in this historical echo the impetus for the reforms France is proposing in the EU today: creating a joint EU defense force (which France, as the most significant military power on the Continent, would surely dominate), instituting a body to oversee all EU economic policy and developing a common eurozone budget. Germany is suspicious of France’s reform efforts because Germany wants to preserve the status quo. The integrationists did their job well: Germany is militarily irrelevant but economically prosperous, and it thinks primarily in economic terms. For Germany, that means keeping the eurozone together so that more European countries can buy German goods. It means making sure that German taxpayers don’t have to bail out Greeks or Italians in times of financial crisis. And it means ensuring that Germany can do what it wants with its massive and ever-growing trade surplus – rather than being forced to spend it on other European countries. For France, the issue is not keeping the eurozone together so much as it is keeping Germany tied to an institutional framework that keeps it weaker than and dependent on France. That is why France is pushing for a so-called two-speed system, in which countries that want more integration can have it, and countries that Macron derides as nationalist, like Hungary, can stop gumming up the works. To accomplish this, France is doing what all aspiring dominant powers do: It is attempting to recreate its would-be partners and institutions in its own image. In this sense, Paris can use Brexit to its advantage, because it means one less powerful voice with which to struggle over defining the EU’s future. Germany, despite and because of its economic power, cannot push too hard because the historical memory of the last time Germany got heavy-handed in Europe is still present. On the flip side, there is no one still living who personally experienced the Napoleonic wars or France’s many attempts to build a mighty French empire encompassing the entire European peninsula. A country like Hungary does not fit in Macron’s EU because Hungary will not kowtow to Paris, and France can afford to sacrifice Hungary or any other Eastern European satellite state. A more integrated EU-16 in which France has a dominant position serves France’s strategic interests better than a diffuse EU-27 – as long as Germany remains in the bloc. France is in a strong position – arguably the strongest position it has been in since before World War I began. Its economy, though stagnant, is still second largest in Europe. Crucially, France’s demographics are relatively healthy. Like most European countries, France’s fertility rate dropped below replacement level in the late 1970s and remained there for roughly two decades. But in the 2000s, France started having more babies while Germany and other countries didn’t. While most European countries are aging, France is getting younger. The dividends of this “stimulus” package will allow France’s economy to grow while young Germans, Italians and Poles will be coping with how to pay for the ever-increasing older share of their populations. And unlike other European countries, France has remained a first-rate military power. France does not require U.S. protection anymore, and that France ever needed it in the first place has always been something of an embarrassment to the Gaullist mindset. The nationalists in France were angered by Macron’s derision. This is the same faction in France that wanted to dismember Germany and wanted no part in NATO or the charity of the Allies at the end of World War II. It is a faction that is as euroskeptic as Macron is euro-smitten. De Gaulle and a generation of leaders after him, though profoundly prideful of the French nation, controlled nationalist extremes because France’s challenges after World War II required a certain degree of pragmatism. France had no choice but to support EU integration and to align itself with the United States, even if it held its nose while doing it. That the extreme nationalist strain in French politics has become stronger even as the current French government pushes for greater European integration is not a coincidence. Both of these foreign policy factions inside France want the same strategic ends: the neutralization of Germany as a threat, the decoupling of French foreign policy from the U.S. and a dominant position for France on the European continent. They just have very different ideas about how to achieve those goals. Macron aims to achieve them with a stronger, French-reformed EU, and that is why he is engaging in a war of words with leaders like Viktor Orban and pushing for new and better “High Authorities” in Brussels. The bureaucrat is mightier than the sword. This is not about progressives and nationalists. It has become cliche to talk about the “German question.” But before there was a German question, there was a “French question.” Based on how France is pursuing its strategic ends, it’s one we ought to be asking ourselves again. The U.S. stock market is worth $32.3 trillion today. Twenty years ago, it was worth $12.9 trillion. That’s an increase of 150%. U.S. GDP looks similar. Twenty years ago, it was $8.9 trillion. Today, it’s $20.4 trillion—a 129% increase. 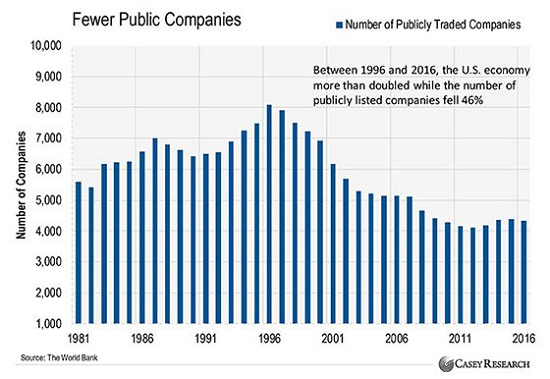 And yet, there are half as many publicly listed companies in the U.S. today as there were 20 years ago. You can see that the number of public companies used to grow in step with the economy. Americans would start businesses, build them up, and take them public when they needed access to more capital. Public companies also became the lifeblood of the wealth-building process for most investors. And for good reason. You see, there’s a gap between what people earn and what they need to retire. Capital gains from investments usually help close the gap. But it’s tough to get out and source private investment deals if you sit behind a desk all day. Even if you do, digging into the details takes time. You also need to make sure you avoid crooks and cheats. I know about these headaches because I’ve been involved in many private investments. Buying stocks is much easier. This is because public companies are required by law to publish detailed financials and operating information. Anyone can access this. In case you’re not familiar with the private equity industry, here’s how it works… High-net-worth investors pledge cash to a specific fund. Once the fund raises its target amount of money—say $200 million—it closes to additional investment. It also closes the door for investors to pull money out. Just after college, I worked as a sales representative for a manufacturing firm. We produced mattresses in 26 factories across the U.S. The owners sold the company for $800 million to a private equity firm. Within months of taking over, I learned that the private equity firm took out a massive loan against the business. 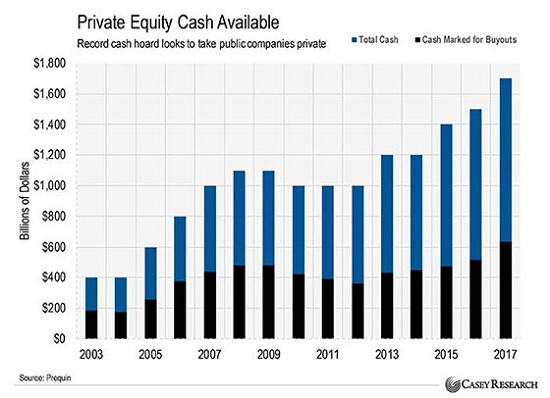 In the coming years, these private equity firms will use this cash hoard to take businesses private, load them up with debt, pay themselves rich dividends, and then leave the companies for dead… just like they recently did with Toys “R” Us. One sector that’s full of these targets right now is the banking industry. My team and I have been hard at work for the past five months researching this sector and believe certain companies should come out on top as this trend continues.